5 stars!! 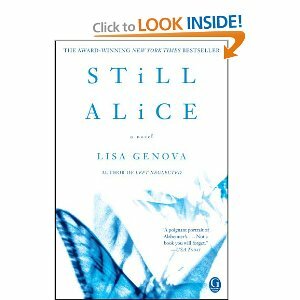 Phenomenal book about a woman in her early 50's and her early-onset of Alzheimers. Just turning 50 Alice, a Doctorate Professor of Psycology at Harvard starts noticing that she is forgetting words, appointments, and even getting lost during a run. She consults a neurologist and they go through numerous tests, first being told it is probably depression, or fatique. Further testing pushed by her husband John, results in a diagnosis of early onset Alzheimers . This book is written from Alice's perspective. The alertness and detailed life of Alice at first, to the last chapter when she is mostly unaware. Brilliant in that it not only is taken from Alice's perspective, but also that it is written so well that you see the emotional changes that her husband and children go through as they become to accept her diagnosis. Their struggle to understand, to live their own lives, yet to go on with their own. Fantastic details about alzheimers, studies on it, medications and how they work, and the brain activity. Only a Doctor in Neuroscience like Lisa Genova could write with such precision and details, yet keeping it readable for the general public. When I finished the book I just set it down with tears in my eyes and said Wow.. amazing book. If you know anyone with Alzheimers I strongly recommend this book. One of the only books that The National Alzheimer's Association has endorsed. I recommend it even if you just want to have a new understanding and perspective on this disease, good chance you sometime will run into someone with it. A real chance to grasp the disease, and the person who still has to live with it. May give you a whole new respect for those suffering with this disease.